Kieran Glover, right, with his support crew today. 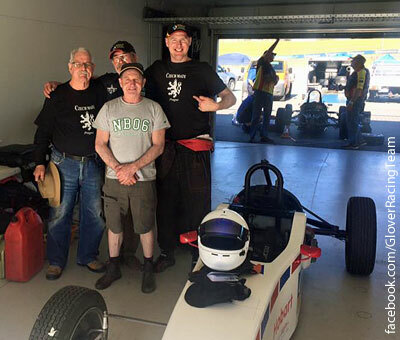 SORELL Creek driver Kieran Glover successfully defended his Formula Vee National Challenge title at Barbagallo Raceway in Wanneroo, Western Australia, this afternoon. Competing in the 1600cc division, Glover was the popular and undisputed winner, finishing well ahead of the rest of the field. A commentator on Facebook wrote: "Well done team! A very hot day, and amazing hard work. No one else on the home straight when Kieran crossed the line!" Formula Vee is regarded as the first proving ground in motor racing and a stepping stone to higher levels of motorsport. Larry Perkins, Jason Bargwanna, Colin Bond and John Bowe all began their careers in Formula Vee.